Employee engagement is a key driver of your company’s success. When was the last time you checked in with your managers? Do you have any idea what this certain department is up to this week? The top management are usually so engrossed with the big picture that they fail to focus on underlying factors that actually have a big impact on the company’s performance. One of these factors is employee engagement. Loosely defined as the emotional attachment and functional commitment of an employee to the organization, it remains to be a driving force. However, employee engagement is deteriorating. Gallups’ Research report shows that there were about 70 percent of U.S. workers who were either not engaged or actively disengaged! How come? Well for example, employees enjoy social media so much that they tend to be more engrossed in the digital world. Technology isn’t the only culprit–there are other factors affecting engagement, or lack of, rather. Make work an enjoyable place and experience. Employee engagement goes down if employees don’t feel happy in the office. Let them work where and when they want to by incorporating flexible time schedules. Do not confine your employees to stay in their cramped cubicles at all times. If they feel happier while working on the office veranda, their output will become much better! Give them opportunities to excel. Start events wherein employees could spend time with each other while not thinking about work. Organize sports fests or birthday celebrations. Hold parties and involve everyone–even the top management! Events like these allow employees to mingle with each other, get to know each other, and feel a sense of belongingness. Another habit that can greatly help in employee engagement is complimenting people. Make this one of your organization’s values by encouraging managers and supervisors to directly compliment staff who are great at what they do. Be open to your employees. Did you know that there is a 94 percent correlation between management transparency and employee happiness? When employees know about crucial or sensitive information, they feel important. In turn, they become more cooperative towards the company’s goals because of their knowledge. They actually feel that they are part of the company in a much deeper sense, and not just on the sidelines. Inform the employees about your annual goals so they can work on aligning their tasks to meet the targets. 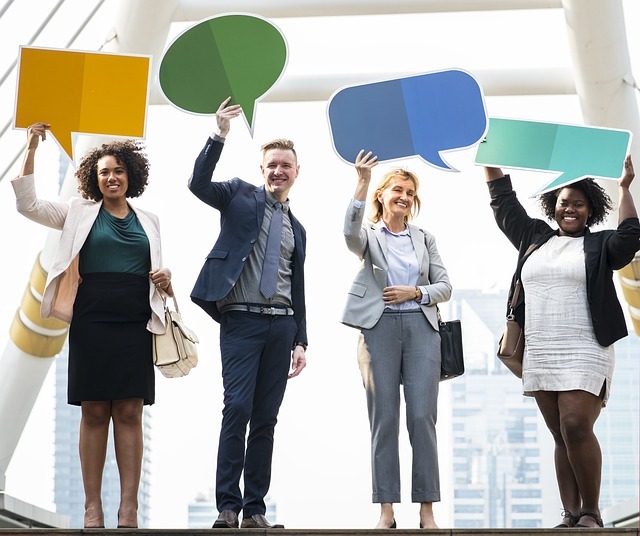 While there are obviously some things that need to remain confidential, any information about the company’s goals and status will make employees feel that they are connected emotionally to the business. Communicate with them by listening to their opinions and feedback as well. Employees really appreciate it when their opinions are solicited because it makes them feel valued. Involving them in brainstorming will also increase engagement–plus, they might have some really great ideas! Don’t forget to express gratitude to employees who give feedback–this will make them feel even more valued which can translate to loyalty and passion for their job and the business. Regular feedback will give you an overview of how things are going in different parts of the company. So it’s best to check in on employees through their department heads every now and then. There are also employee engagement software programs available which can actually provide real-time reports on engagement in the workplace. These are just three ways to increase employee engagement. While there are more ways to do so, these three are crucial and have positive effects in the long run. In fact, corporations with engaged employees are more productive and perform better compared to businesses with disengaged employees. Remember, employee engagement cannot be achieved in one day and by one person alone. The first step lies in recognizing that it is something your business wants to attain. Put your people first, and watch your organization grow and bloom into something bigger—a fully developed company with passionate members all working side by side to reach their goals.